Winter Birding Weekend in the Central Adirondacks! 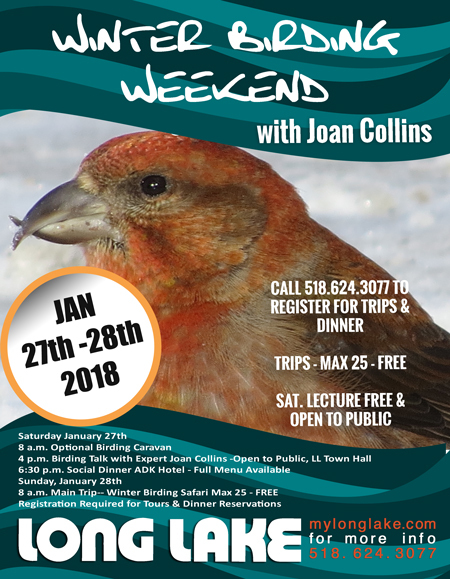 Presentation: Saturday afternoon at 4 p.m., Joan Collins will present “Winter Bird Visitors of Northern New York” at the Long Lake Town Hall. Each year, avian visitors from the far north move south to spend the winter in our northern New York region. Some of the species, like Bohemian Waxwing and Snow Bunting, can be found every winter. Other species, such as Pine Grosbeak, irregularly irrupt, while some species visit on a fairly regular schedule, such as the Common Redpoll, which arrives every-other winter. Why the birds move to our region, and where you can find them, will be discussed. The presentation, which is open to the public, will feature nineteen species that visit northern New York in winter using photographs, audio, and video. Places to Stay: CLICK HERE FOR A COMPLETE LIST OF Hotels, Traditional Lodgings and Alternative Locations. The Long Lake Diner opens for breakfast at 6:30 a.m. Stewarts offers quick breakfast items. On Saturday, participants can pre-order lunch from the ADK Trading Post Menu for pick-up along our birding route. Menus will be sent to participants. Sunday’s lunch plans will be decided as the winter progresses and our birding route is planned for that day.